5/28/17: Affordable Housing, Wastewater Improvements, and an Award! Being in city government is frequently fascinating. I’m always learning new details about how certain technical sub-areas operate. This week’s “ah ha!” involved understanding more about how affordable housing is accomplished in a high-land value city like Encinitas. 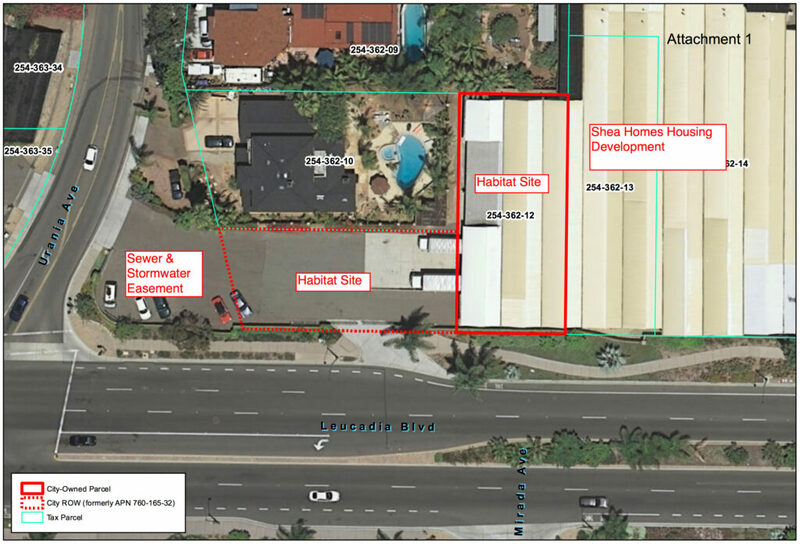 At our Council meeting last week, we approved a proposal for Habitat for Humanity to pursue building two homes – with the possibility of two accessory units – on a remnant of land owned by the city at the corner of Leucadia Blvd and Urania Ave. The city owns very little undeveloped residential property, and therefore our options for projects that depend on donated land are limited. I was thrilled when the executive director of Habitat for Humanity, former Escondido Mayor Lori Holt Pfeiler, approached me with this idea for an otherwise unused and almost unusable piece of land on a busy road. It’s being proposed adjacent to a subdivision of 13 homes being constructed by Shea Homes on a former greenhouse site. We’ve been using the site for some occasional storage of city equipment. A partnership between the developer and Habitat allows synergies that could reduce the cost of the affordable housing project. The two parcels in the center labeled “Habitat Site” are the city-owned lots which would accommodate two-to-four affordable homes. The white buildings on the upper-right were leased for many years by Specimen House, a wholesale nursery that grows palms and other tropical plants. The land was sold in 2016 to Shea Homes, which is now planning 13 homes on the site. Specimen House has a new owner and has moved its operation to Oceanside. A very interesting part, to me, is the math behind these projects. We would lease our 16,700 square feet (2/5ths of an acre) to Habitat for a 55-year term, which is the maximum allowed by law. Habitat would then build the two homes and sell the homes — not the land — to current Encinitas residents making between 50-80% of median income, which translates to about $70,000 for a family of four. The family will spend about 30 percent of their income on all housing costs, so their monthly payment is between $1,000 and $1,300 a month, including mortgage, taxes and insurance. The mortgage is provided through Habitat, which offers a 0-percent, 30-year loan of about $250,000. The property taxes are lower than fair market value because the county gives a break on taxes according to a complicated formula. Instead of money, the down payment is 500 hours of sweat equity into any Habitat project, which may or may not be the specific home purchased. We asked Habitat to screen potential applicants based on whether they already live and work in Encinitas. We want to provide for our residents first. If the owners want to sell the home, they sell it back to Habitat and essentially recoup only what they paid into the mortgage. In order to qualify as lower income to buy the home, Habitat looks at three years of tax returns to verify income level. If the homeowners get a raise and a promotion and make more money, there’s no penalty – they’re moving up in the world! They don’t have to sell or move out. If they lose their jobs and can’t pay the mortgage, then Habitat takes back the home and finds a new family to buy it. The City Council wasn’t required to discuss this in public because, as a lease or sale negotiation, it could have been a closed session item. But we unanimously decided to hear it during our public meeting to provide maximum government transparency and allow anyone with an opinion on the subject to directly address the council. We had no public speakers on the topic and one email in support. Speaking personally, I believe it’s important for the city to keep our land and not sell it, so a long-term lease was the only appealing option. It seems short-sighted to sell off assets that can generate income and provide flexibility for future city needs. I’m excited to support this project by providing even a small amount of newly constructed affordable housing in the city. I recognize that on the one hand this is just a “drop in the bucket” when it comes to the affordable housing crisis, but on the other hand, “little drops make a mighty ocean.” We do what we can! A San Diego Union-Tribune article about the project can be found here. We unanimously approved an agreement for a $23.8 million bond for three phases of improvements to the San Elijo Water Reclamation Facility in Cardiff. The city’s portion of the annual debt payment will be about $672,500, which is about the amount we’re currently paying on wastewater bonds that will expire soon. The project includes odor control improvements, preliminary treatment upgrades, carbon emission reduction, dewatering, corrosion repair, pre-digestion treatment and secondary treatment improvements. Also included in the plan is a redesign of the wastewater campus that will provide overflow parking for the San Elijo Lagoon visitor center, remove the portable office buildings housing employees beneath active power lines, and improve security by eliminating the need for delivery and visitor traffic to drive past all the sensitive treatment infrastructure in order to check in. I’m happy to support the modernization of the 60-year-old San Elijo Water Reclamation Facility, which will result in converting more wastewater into recycled water at a safer, more efficient plant. I sat on the board of this very well-run wastewater organization for two years as a City Councilmember and believe that all these improvements to the facility are warranted. 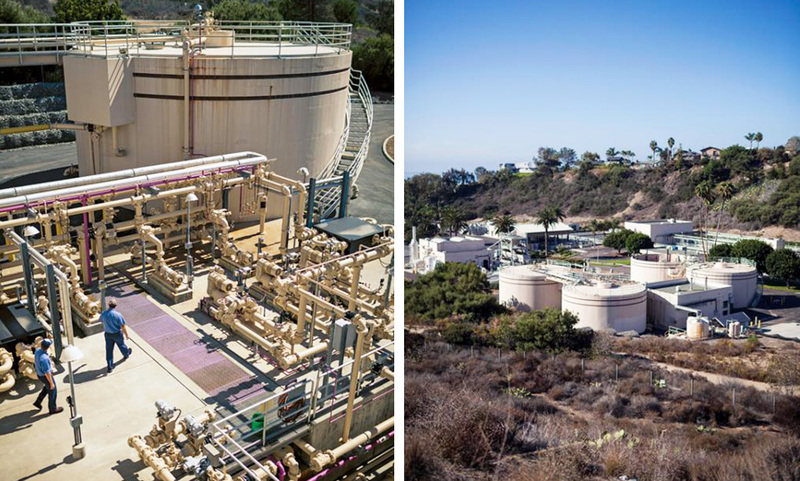 The San Elijo Joint Powers Authority is a leader in getting recycled water to public facilities in our area, with large swaths of land using this plant’s recycled water along the I-5 freeway, the Encinitas Ranch golf course, and the 44-acre Encinitas Community Park. Under the professional guidance of General Manager Mike Thornton, the agency routinely earns the recognition of its peers by winning awards for service, reliability and innovation. I formerly sat on this board with Councilmember Mark Muir, who has an extensive background in water and is currently the chair of the entire San Diego County Water Authority. 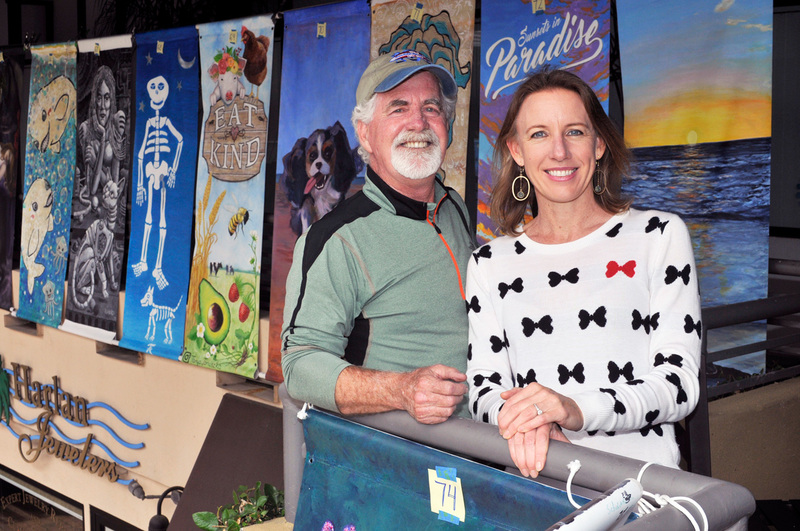 Councilmembers Tasha Boerner Horvath and Joe Mosca are current board members, together with two members of the Solana Beach City Council, Dave Zito and Ginger Marshall. We approved executing a contract for more than half a million dollars toward creation of a quiet zone at the Chesterfield railroad crossing in Cardiff. This is being done as part of the larger double-tracking project in the San Elijo Lagoon. The improvements include the installation of electrical conduit, raised traffic medians, and foundation supports for future rail gates. Creating a quiet zone costs money because additional safety measures must be contructed at the crossing – if the train horn doesn’t sound, there have to be other ways to alert and protect people so they don’t step or drive in front of a speeding locomotive. We approved city staff getting a grant of $283,000 from SANDAG for a walking path between South Cardiff State Beach and Cardiff’s restaurant row on the west side of Highway 101. This is part of the dune restoration effort called the Cardiff Beach Living Shoreline Project. I’m grateful for the initiative shown by Program Administrator Kathy Weldon, who is spearheading an innovative project to re-create the dune ecology and provide better connectivity and mobility along a dangerous section of Highway 101 near our border with Solana Beach. I attended the 600-person San Diego County Taxpayers Association annual awards dinner for the first time, and Encinitas was a finalist for two awards which were compliments, despite being humorously backhanded. We were nominated for the “Leaving the 20th Century” award for the city’s implementation of electronic bidding and automated job recruitment. Encinitas won the “It’s About Time” award for our redesigned website, the new SeeClickFix app (which is really great, allowing residents to instantly report problems they see) and other technology improvements that streamline operations and make it easier for the public to interact with the city. There were some very funny riffs and lots of poking fun at local elected officials, media and involved parties. There aren’t many local events like this and the evening was a hoot. 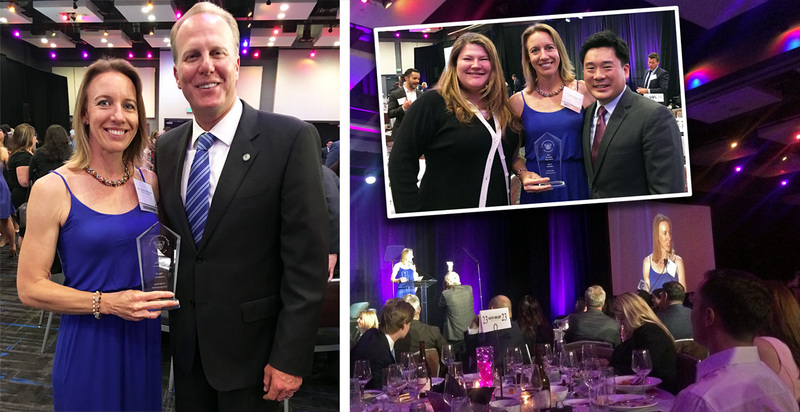 At left, San Diego Mayor Kevin Falconer congratulates Encinitas for winning the “It’s About Time” award; and at above-right, Councilmember Tasha Boerner Horvath and I savor the moment with Taxpayer Association President & CEO Haney Hong. I accepted the award on behalf of the city. Next week at the City Council we start the two-year city budgeting process. And finally, have you noticed the large amount of trash accumulating in the bushes and overgrown weeds along I-5? It’s visual blight that needs attention. At the city we’re very responsive to complaints and suggestions (see the SeeClickFix app above), so I have to believe that Caltrans is, too. I’ve passed along my feedback, but there’s strength in numbers. If there’s a section of road that bothers you, please report it to Caltrans for clean-up here. You’ll need to report a particular section of road, not just the freeway in general. Happy Memorial Day weekend to you and your family! Remember it’s more than a day off work; it’s a time to honor the men and women of the armed forces who lost their lives serving our country. Interesting fact I learned from the U-T on Saturday: after the Civil War, the first Memorial Day speeches stressed reconciliation between the northern and southern parts of our country.